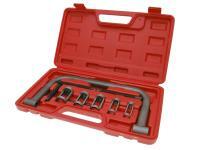 Universal tool set for mounting valve springs with 16-30mm outside diameter. Changing valves or valve stem seals always requires removal of the valve springs. Due to the special wedge clamping of the spring plate assembly without this special tool it is almost impossible. This tool allows fast, professional and absolutely easy disassembly and assembly of these components. An absolute must for workshops and hobbyist who often tinker with 4-stroke engines.